In this first of several posts, I attempt to frame the questions and issues behind this discussion. Feel free to email me at ali @ sfpsmom.com if you have a topic you’d like to see. CARE/SFUSD_parentwatch proponents (read: some Lowell families and staff) who originally marketed their proposal as “two-track accelerated Algebra” have repackaged their plan using the words “optional pathways” and “choice” to advocate for a reinstatement of tracking in SFUSD. There is over 30+ years of overwhelming research showing tracking is harmful to students tracked into “low-performing” classes. Worse yet, tracking by perceived ability has unquestionably racial implications. Under the SFUSD’s previous system, students were tracked from 6th grade into either “honors” or “regular” classes. This data was provided by SFUSD. It shows student enrollment in district “honors” vs. “regular” math classes PRIOR to the implementation of the new math sequence. 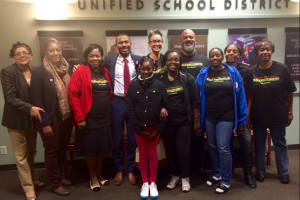 The picture above demonstrates how FEW Black and Brown students have been enrolled in the district’s PREVIOUS two-track GATE/honors system (which CARE/SFUSD_parentwatch is currently advocating.) This chart shows student enrollment in 8th grade accelerated math (Algebra 1) vs. non-accelerated math (General Math), prior to the new 8th grade “Algebra 1 for All” policy. 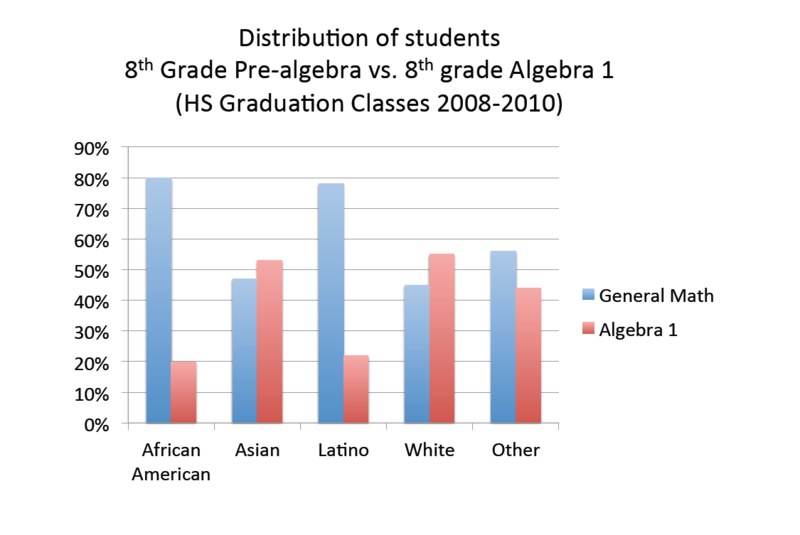 Broken down by ethnicity, roughly 50% of Asian, White, and Other students were placed in Algebra 1, while only 20% of African American and Latino students where placed in the Algebra 1 track. Student placement in 8th grade classes was determined by previous enrollment in middle school honors classes (6th and 7th grade), which in turn was determined by teacher and parent recommendation, and scores on standardized tests. These “merit”-based ways of determining access to educational programs are rife with problems and have many racially-discriminatory outcomes, which is clearly evident in student enrollment math courses like those shown above. Arguing in support of tracking is akin to denying the realities of global warming. The reason SFUSD is making changes to it’s math sequence and GATE programs is because our district can no longer deny the social stigma and other harmful effects of tracking, especially on our most vulnerable students. All students deserve to have challenging curriculum in diverse classrooms that support and recognize the unique talents and skills they bring. Well differentiated, mixed-ability (heterogeneous) classrooms are the solution to both providing challenge and support to all students without social stigma and other harms of tracking. In order to make this happen, families should work to monitor, advocate and support quality differentiation in all classrooms. Clear systems of communication and parent leadership opportunities for GATE program implementation, including: program expectations, assessment and MOST IMPORTANT (!) a clear system of accountability when differentiation isn’t working or when students are having problems. 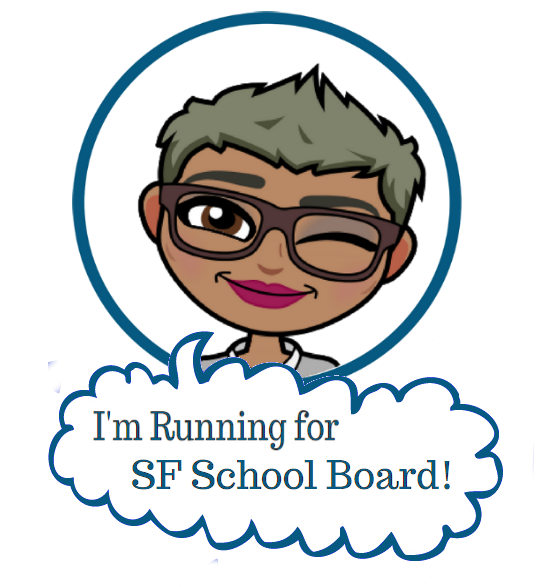 What questions do you have about tracking or the proposed CARE/SFUSD_parentwatch plan? Write me in the comments below. Thanks for this. It is interesting with a kid not in Private College, Private HS, and Public MS, we have been fortunate never to have lived in a “tracked” school. I do know that some parents wanted it, heck even our kids wanted it, but our administration has held strong to NOT tracking — we are so grateful for that. As far as honors and AP goes, while it has shaved off a semester for our daughter in college, not sure that she NEEDED it. Such a hard cultural/social wall to push against. Thanks again for this! Great article on this issue. I agree with your recommendations for differentiation as opposed to tracking. However, in order for differentiation to work well, class size must be addressed. It is nearly impossible to differentiate effectively with class sizes of 25 plus students. I think part of the reason students start struggling with math in middle school and high school is because typically classes are larger and thus, less personable and personalized for students. I’m not sure that anybody from CARE really cares about tracking. I think they care about getting their kids a good math education that will prepare them for highly competitive college admissions and eventual STEM careers. This probably means accelerating through the basics as fast as possible to leave time for advanced calculus AND calculus based science courses in the Junior and Senior year of high school. The current math sequence doesn’t seem to support this. If it did then I think most of the opposition would evaporate. I agree that MANY parents are concerned with the pace and perceived availability of math courses in high school. Nonetheless, there are ALSO many CARE proponents who are advocating for a tracked system in middle school as well as honors classes in both math and English at both levels. I presume there are many voices on both sides of the debate, and I’m sure you won’t find TOTAL alignment with any parent group. Unfortunately, the tone of many email posts and comments I’ve heard have gone beyond AP Calculus concerns to advocating for their kids to be in separate classes with kids who aren’t “slow” or “disruptive” (I have emails to prove this.) Whether those folks like it or not, there are many highly visible member of the Lowell (CARE) campaign that ARE arguing for tracking. I hear what you’re saying. Certainly some people are advocating tracking but my point is they are only doing so because they see it as the only way to get to multiple AP calculus and science courses in the 11th and 12th grades. If what the superintendent is true and algebra 1 really no longer exists then why are they making all ninth graders take algebra 1? I’d suggest moving the content from the ninth grade algebra 1 into the seventh and eighth grade math courses, start geometry in the ninth grade, AP calc in eleventh grade, and then elective AP math and science courses in 12th grade. If you did this I think you’d win over 90% of the critics. I don’t think we are comparing apples to apples here when it comes analyzing differences between the previous CA standards aligned Algebra and the current CCSS Algebra being taught in schools. Additionally, in reviewing the literature that SFUSD has presented, students are exposed to algebraic concepts as early as 8th grade, in addition to statistics, geometry, etc. Superintendent Carranza also reiterated this in his remarks at the BOE meeting last night. I do agree, though that there are a large number of parents I hear whose primary concern is HS math sequencing. That said, I don’t know how one would determine what percentage of CARE proponents this represents. Fair enough. Clearly the content of math has changed with the adoption of common core and algebra concepts are being introduced earlier. I’m saying just take that a step further and cover all of the algebra content in the seventh and eighth grades. I think that’s what other districts in the area do and they have not experienced the same backlash. I think if the district came out with such a proposal it would be welcomed by most all as it allows everyone to pretty much take all the most advanced AP courses. If people still resisted then the allegations of racism would hold more weight, but there are very honest and real reasons to object to the math track as it currently stands that do not rely on racism. Hi, very involved Lowell parent here. I had not heard of the CARE group before the Board of Ed meeting yesterday. Are you sure they are a Lowell parent group? The leaders of the CARE group and almost every parent I have spoken with about the CARE initiative are Lowell families. Missy Sue of the Lowell PTA started off the public comment at the Board of Education meeting last night after organizing several Lowell students to speak. This was followed by a myriad of other Lowell parents who had organized to make comments. At the SFUSD enrollment fair two members of the Lowell community (a father and grandfather I think) were handing out CARE pamphlets and holding signs. On the PPS-SF listserv MANY (not all) of the parents/grandparents who are pushing CARE proposals are Lowell parents. In speaking to Jill Tucker for the SFGate article, she said she believed most of the displeasure with the new math policy was a coming from Lowell families. She also hypothesized the CARE movement was originally started by Lowell teachers. This aligned with reports I heard from parents LAST fall that Lowell math staff were telling prospective parents to fight the math sequence and suggested they PULL their kids from public school if the policy stayed put. Additionally, one iteration of the “Pathways” proposal presentation have cited negative impacts to a significant percentage of the SFUSD population due to the fact that Lowell is the largest high school in the district. I am now hearing more voices from across the district. So it has, in all fairness, expanded beyond “just Lowell”. Nonetheless, based on all of this evidence and my interactions with folks at the forefront of the CARE group, it remains PRIMARILY a Lowell powered and Lowell focused initiative. OK, I am officially really confused. I thought that CARE and Missy Sue Mastel’s group were different groups with different proposals – are they the same? I saw a petition from Missy Sue Mastel about choice pathway thingies, but is CARE the same or do they have a different proposal? There is an email at the bottom of the CARE flyer listing greatpublicschoolsnow @ gmail.com. They list the SFUSD_parentwatch listserv as a contact. These flyers were handed out by a Lowell parent who stood outside the SFUSD Enrollment Fair. He is the same person who was present at the Board of Ed meeting last Tuesday. He came with a young Lowell student (I am assuming his child?) who spoke first at the Board of Education meeting regarding support for the “Pathways” proposal. 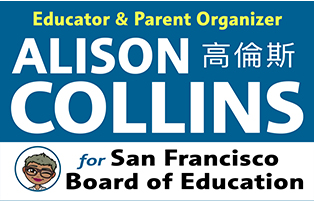 The proposal on the website lists SFUSD_parentwatch as the “author” of the petition. In addition, many of the pro-CARE/SFUSD_parentwatch folks ALSO seem to be from Lowell. There are some from other schools, but it seems like the largest supporters of this group are from there as evidenced by the list of speakers present. Thank you for sorting through all of this. I’m wading through lots of background information on your site (and linked from your site) about the math sequence, etc, and it’s very informative. Thanks! Another involved Lowell parent here who had never heard of CARE before this week. I asked around and you are correct that a Lowell parent is involved in it (or maybe “is” it). But to extrapolate and suggest that the group is affiliated with Lowell or the Lowell PTSA, or is a group representing a broad collection of Lowell families, is not accurate. Stan, Maya, Annette, Don seem all to be deeply involved in this movement. They are all active and vocal Lowell parents on various parent listserves. I also know some teachers are actively involved. You do raise a good question though. Who is actually a member of this movement and why do they tolerate such offensive racist language? It really does a disservice to parents who both care about educational access and equity AND excellence. I am not a Lowell parent, but do not believe that removing honors/algebra 1 from Grade 8 will benefit my child in any way. Neither the aa pac nor you (or the board of education) have spoken about what support we need for the non “high-achievers” Not just in Math, but also English and Science, and all other subjects. Also, where is the data for your chart located. i wanted to see the raw numbers and not just percentages. I received data directly from the SFUSD math department. I got this chart directly from Jim Ryan, the Executive Director of STEM and supervisor of the Math team. It looks like it covers two years of enrollment. You’ll have to contact him to get the raw numbers. As far as the AAPAC letter states AAPAC members want “full implementation” of the Math Course Sequence which includes “differentiation”. The district and I have both articulate that differentiation is the way to support ALL students. I have personally differentiated for classes of 30+ students. I worked with a para who worked in my class supporting students with IEPs. I had an exceptionally large number of students with IEPs because I like differentiating and don’t consider different learning styles a problem. Thus counselors put these student in my class. It takes good instruction, which arguably is only effective if you have a good mastery of the content. Experience is also key to building up a bit of a toolkit of resources. This is not “easy” but just good teaching. BTW: I also enjoy differentiation for “high performers” by giving them “special independent projects” which they were able to share with the class. They also got “enrichment” outside of class through participation in our school debate team at Galileo. (We won 2nd Place in the Bay Area!) Two of them went on to Berkeley. That said, I want our district to do a better job at supporting differentiation for kids who need more challenge. My girls are in this boat and I often suggest ways to create opportunities for them to expand or deepen the level of their work. Some teachers do this naturally, and some need prodding. So I do agree (AAPAC parents as well) that is what we should be focusing on. Ignorant question, please forgive: it sounds like you were doing excellent differentiation in English or some other humanities class. 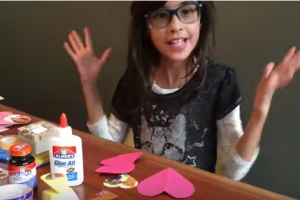 Can you differentiate math instruction the same way? I thought math was more sequential? I’ve seen really excellent elementary school differentiation for reading and writing, but seemingly less for math? If you have any links to references on how to differentiate in math classes, that would be so helpful. Many apologies if you’ve already linked them, there’s just so much to read, I may have overlooked. Thanks! I think differentiation has always been challenging, but the term has been around for a LONG time because it’s considered just GOOD teaching. As teachers move away from teacher-centered instruction and teaching “the text book” they move into being more of “facilitators of learning”. I know this may sound strange, but if you want to chat a bit, I’m happy to explain. Project-based learning is a great example of this where kids have a lot of choice in the task and ways they demonstrate mastery. They work in groups that can be set up by teachers heterogeneously to share stengths (e.g. high-performer who’s shy gets paired with a kid who may be behind but is good at presentation and public speaking to present on a project) or you can do skill-based groups within the classroom that are flexible. This is definitely a great question and one I’d like to see SFUSD do more work in SHOWING families what this looks like when it’s done properly.